Selecting the perfect short and to the point message to put in a card for newlyweds who deserve every happiness can be difficult. You want a message that reflects who they are to you, shows them how much you care, and that can fit in a card that they can read easily. Regardless of whether you’re the mother of the bride, maid of honor, or an acquaintance from work, you can make the happy couple’s day with the right message in the card that you give. While gifts are great and useful for a time, a card can take their breath away for years to come and provide special memories when they think of you and their wedding day. Now to find the perfect message for this life-changing card. A family member or best friend can probably get away with anything straight from the heart. The point of a card on this day is to send the couple a message that sounds genuine and unique, so if it sounds like something you’d say and fits your personality then they’ll love it. If you’re a jokester and that’s your identity to them, don’t overlook the funny message. Choose a joke that sounds like you, otherwise it might not feel genuine. Changing your personality by picking a romantic, touchy-feely card if you’re not that kind of person is going to make it feel forced, like you’re sending a card because that’s what tradition calls for. If the couple is religious and that’s a major part of their lives, go with a religious message. Include a Bible verse or a phrase that they’re sure to recognize and remind them of God’s views on marriage. Written below are also good card messages for best friends or parents, including some rather sweet or funny father of the bride messages. Any of the messages in this article are unique, fun, and sure to put a smile on the happy couple’s face for years to come if used to fit your personality and relationship with them. A heart-warming card is a touchy-feely, sweet, romantic card that takes the happy couple’s breath away and can contain anywhere from a personalized message from a parent to a generic well-wisher message. Wedding bells ring, all the birds sing. 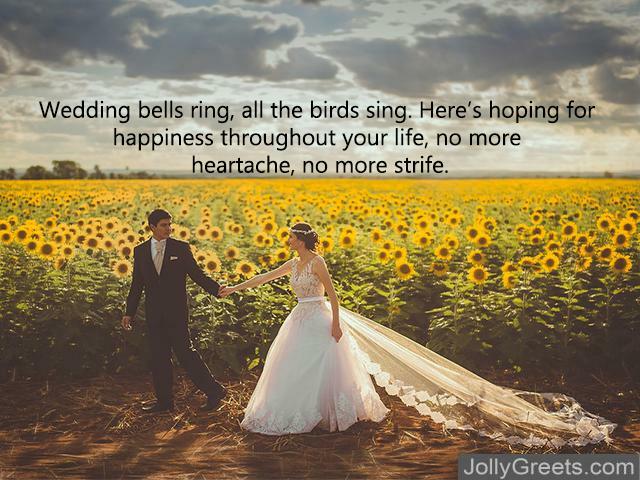 Here’s hoping for happiness throughout your life, no more heartache, no more strife. Forever his beauty, always her beast. A tale as old as time, a word without a rhyme. 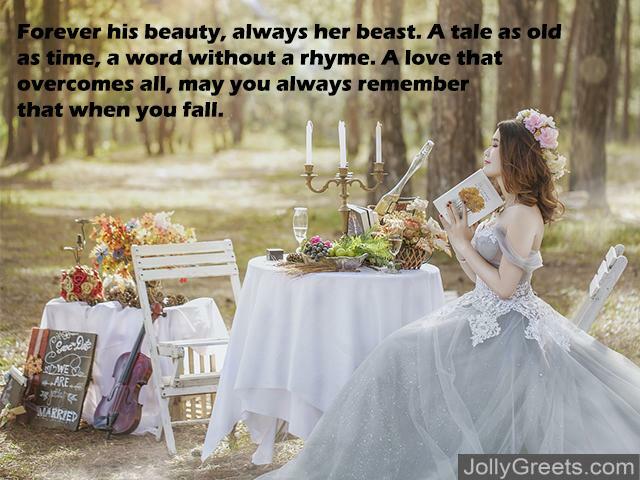 A love that overcomes all, may you always remember that when you fall. There’ll be joy and there’ll be tears. Here’s wishes of luck throughout all your years. This is a day to let go of your past, knowing that this time you’ve built it to last. Remember mistakes, give more than you take, trust in your love, never give up. Roses are red, violets are blue, may your hearts always stay true. 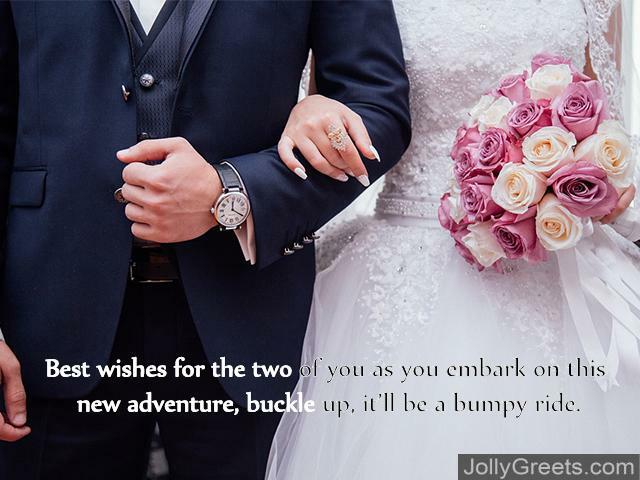 Best wishes for the two of you as you embark on this new adventure, buckle up, it’ll be a bumpy ride. (From bride to groom or vice versa) No matter what scares you I want you to know, I will be with you, wherever you go. (From groom to bride) I’m so happy you’re becoming my wife, here’s to our brand-new life. (From father to bride) I remember soccer and ballet classes. I remember broken plates and spilled milk glasses. I was there for your ups and downs, now a new man has come around. It’s his turn to dance with my princess, so here are my well wedding wishes. If the newlyweds are religious and they care a lot about their religion then it’s an excellent idea to stick with giving them something with a nice religious message in it to get them through their upcoming trials. Marriage, God’s holy union. May he bless you in this eternal communion. (For groom) Let go of your mother and father, cling to your wife. She’s your support for the rest of your life. Caring, in sickness and in health. Loving for richer or poorer. Honoring for better or for worse. Those are the vows you make today; may you always remember them. (From groom to bride or vice versa) Jeremiah 29:11 “For I know the plans I have for you,” declares the Lord, “plans to prosper you and not to harm you, plans to give you hope and a future.” You are my hope, my future. You are a fulfillment of God’s promise to me. I hope to be the same for you in the years to come. Always remember 1 Corinthians 13:4-7 and let that verse be a light that guides this God sanctioned marriage. God has brought you together, never let the world pull you apart. Be that person who always has a joke to crack, no matter the situation. It may not seem like an appropriate occasion to bring this type of card to, but if the couple likes to laugh and you ensure the message fits their personalities, then this is the unique choice you should make for your card. Cash, cake, presents galore, and like 23 toasters you’ll be returning for sure. Happy wedding day and future anniversary, don’t forget to entertain the guests before you leave. (From bride to groom) Congrats. You deserve many years of happiness for surviving my dad. Welcome to the world of marriage, next comes your baby carriage. What do you get the friend who has the greatest new spouse on their wedding day? A card because you forgot a gift, Happy wedding day! (From mother of the bride) Take care of my baby girl or be prepared for mama bear to be released. (From friend of the groom) Careful, that one’s feisty… Oh, and his new wife is awesome. (From friend of the bride) Love the colors, love the music, love the dancing, love the food. But seriously though, I’m here for the bouquet toss. I need that luck.